Total Recall is a fairly uneventful and run of the mill linear shooter, despite the story potential. Some games sleepwalk through their intended goals, never really standing out from the pack and instead feeling a little too derivative and safe. Total Recall is one such game, something that's not entirely unexpected given the reputation of movie tie-in games. Total Recall is far from the longest of games, best regarded as a teaser to the forthcoming release of the Total Recall movie. With only eight levels currently available, there's a promise from the developers for more levels to be included soon. It could do with them, as the game's far from long in its current state. 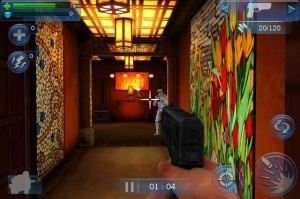 Despite the appearance, Total Recall is an on-rails shooter with players solely controlling where the gun is pointed rather than the direction taken. This restricts variety quite a lot. Enemies are far from the brightest of bunch and it's more the battle of lining up the shot quickly that will punish players. Action is also far from fast paced despite what one would expect from an action game. With the full asking price of $1.99 (Total Recall is currently on sale at $0.99), you'd be forgiven for assuming that's the only money expected of any buyers. However, there are in-app purchases available, each of which providing boosts such as increased damage, defense or the option of new weapons. This feels a little mean, although at least it's possible to grind in-game cash through completing levels often. A Mission Challenge section also adds structure and the means in which to earn more with rewards for fast completion and accuracy, amongst others. The biggest flaw lies in Total Recall's mediocrity. It all feels just ok, nothing that really inspires any emotion. There's a slightly intriguing comic book interlude between levels that might tempt in fans of the film but that's about it. It might not be the worst game out there but nor is it anywhere near the best.